Australian Standard AS1288 covers all installations of glass that might be prone to accidents (eg sliding doors, low windows or glass near playgrounds etc). Glass covered by this standard MUST be Grade A safety glass (and in some situations Grade B Wired glass) in order to comply with the standard. Low Level Glass in Residential Buildings - Grade A safety glass required where the lowest sightline is less than 500mm from the floor. Schools, Early Childhood Centres, Aged Care Buildings, Retirement Villages and Nursing Homes - Grade A safety glass is required within 1000mm of the floor in schools and within 1500mm elsewhere. Doors and General Application - All doors and any glazing within 2000mm of ground level of all buildings are considered subject to risk of impact on human safety and have a Grade A safety requirement. 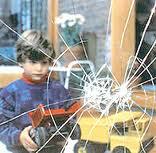 Tinting Direct has installed Safety Film in over 60 Family Day Care homes and offers carers a FREE glass safety audit. The information kit can be obtained from the Family Day Care co-ordinator for your area. Smart Films 100-Micron Clear Safety Film makes glass safer (it upgrades ordinary annealed glass to meet the Australian human impact safety standards) and performs an excellent job holding broken fragments of glass together to provide a physical barrier between the broken glass and human contact. 100-Micron Safety/Solar 20 Film provides the benefits of a solar control film while also upgrading the glass to meet the Australian human impact safety standard.